"Trudeau made what is an unequivocally historic visit to a First Nations community in crisis. The people of Shoal Lake 40 have been living under a boil-water advisory for 17 years. They've pleaded with one federal government after another for financial help to build the infrastructure for clean drinking water. "But no Canadian news organization was permitted to document this historic encounter on the reserve that straddles Ontario and Manitoba. The Trudeau PMO permitted only a crew from Vice Media, the New York-based company which is expanding in Canada, to record the visit." "Globe and Mail columnist Margaret Wente has again been accused of plagiarism and the newspaper’s editor-in-chief has apologized, saying her work 'fell short' of the paper’s standards.
" It also criticized Wente for leading with a similar anecdote about bears, paraphrasing two of his other observations without direct attribution and paraphrasing from a different article without linking to or citing the original author. "Wente did not immediately reply to a request for comment from the Star. The online version of her column has been updated to include attribution, a link to the other article not previously cited and an editor’s note that apologizes to Ausubel." In its brief TV life, Al Jazeera America lost more than half a billion dollars. That’s according to a lawsuit filed by the former evp of finance Anand Gupta, TV Newser reports. According to the New York Times, Gupta is suing the now-defunct network for not being given a promised promotion. Gupta claims former network chief Ehab Al Shihabi, who was sidelined in May 2015 after being named in another employee lawsuit, promised him a promotion to CFO, but that his successor Al Antsey reneged. Gupta’s suit includes financial details including that the network had an operating loss of $250 million in 2013, and $335 million in 2014. Ottawa is ready to blow up the rules governing Canada’s $48-billion broadcasting, media and cultural industries, arguing that decades of technological changes and government inaction have left a broken system in need of a revolution, the Globe and Mail's Daniel Leblanc reports. The New York Times Co. is preparing to lay off a few hundred staffers in the second half of the year, The New York Post reports. Chairman and Publisher Arthur Sulzberger Jr.’s management team has been talking with some of the Times’ unions to come to a deal to provide reduced severance to those affected, sources told The Post. Australian Mike Duffy getting Tweets aimed at our Mike Duffy! The Mike Duffy trial was a top trending topic on Twitter across Canada Thursday, with tens of thousands of tweets from journalists, politicos, and everyday citizens alike. After Duffy's acquittal on 31 charges of bribery, fraud, and breach of trust, some people took the time to tweet their congratulations, or their disappointment and disapproval, to Mike Duffy. There was only one problem. Senator Mike Duffy isn't on Twitter and the recipient of those tweets has never been to Canada. Mike Duffy is an Australian reporter with Seven News, based out of Sydney. The two share a journalistic background and a similar haircut - something the Australian Duffy enjoyed mentioning - and the Down Under Duffy says he couldn't help but be amused by the whole affair. Steve Ladurantaye has been named managing editor of digital news at the CBC. He will be responsible for strategy around digital news. According to the memo sent to CBC staff on Apr. 15, he’ll also oversee “journalistic programming and staffing of CBCNews.ca.” Ladurantaye was head of news and government partnerships in Canada and the global chair for news at Twitter for just over two years. Prior to that, he was the Globe and Mail’s media reporter. Argent, Canada’s only French-language business TV channel is shutting down after an 11-year run, its owner, Quebecor Media's TVA Group Inc. announced. The network said it made the decision reluctantly, saying that despite numerous efforts in recent years, it was “difficult if not impossible” for the specialty channel to maintain consistent profitability. A financial summary provided to the CRTC shows that Argent was profitable for several years but lost money from 2012 to 2014. The station’s subscribers reached nearly one million in 2010 before crashing to 552,000 four years later. Its pretax profit margin slid from 10 per cent to negative 31 per cent over that time. By contrast, Toronto-based Business News Network, owned by BCE Inc., topped six million subscribers in each of those five years and boasted a margin of between 36 per cent and 44 per cent throughout the period. A TV reporter who was covering the destructive flooding in Houston helped rescue a man who drove his car into a flooded underpass and appeared confused about what to do next. In the incident captured on video Monday, KTRK reporter Steve Campion yells, "Dude, you've got to get out of the car!" The car begins to sink and the man appears baffled. Eventually, the man opens the passenger door and crawls out into the water as the reporter yells: "Leave the car! Swim!" The driver swims toward Campion, who wades out into the waist-deep water and extends his hand. As the car slowly sinks under water, the driver tells Campion that he's OK, but didn't realize the water was so deep. “At a time when journalism and independent media around the world are under acute pressure, from forces both financial and political, the New York Times has never had a better opportunity to expand its mission and its reach,” the company said in an internal announcement from Times publisher Arthur Sulzberger Jr, chief executive Mark Thompson and executive editor Dean Baquet. The NYT receives about 375m visits from readers globally each month. However, just 26.6% of web traffic is from outside the publisher’s home market of the US, where it is the sixth biggest media site, according to figures from SimilarWeb. (Media release) "The Canadian Journalism Foundation (CJF) is proud to announce the shortlists for the CJF Jackman Award for Excellence in Journalism in the large and small media categories. "The annual awards recognize Canadian news organizations that embody exemplary journalism with a resulting impact on the community they serve. Since 1996, the CJF has honoured news organizations that embrace ideals of journalistic excellence – accuracy, independence, accountability, courage and originality – with this prestigious award." The winners will be announced on June 16, 2016. A well-known social media journalist was sentenced to two years in federal prison Wednesday after he was convicted of conspiring with the hacking group Anonymous to break into the Los Angeles Times’ website and alter a story, AP reports. Despite his role in the news media, federal prosecutors in Sacramento say Matthew Keys, 29, of Vacaville was simply a disgruntled employee striking back at his former employer. U.S. District Judge Kimberly Mueller sentenced him Wednesday after he was convicted in October of providing login credentials to The Tribune Co.’s computer system. "Corus Entertainment Inc. weathered another tough stretch for television advertising to report higher second-quarter revenue, beating expectations thanks in part to the launch of new specialty TV channels under the Disney name. "The results mark the last time Corus will announce earnings separately from the Shaw Media assets it purchased for $2.65-billion from Shaw Communications Inc. The deal closed April 1 and the two businesses are now being combined, with a revamped executive team rolling out a plan that will include cost cutting and job losses but is also expected to make Corus more competitive in a shifting media landscape. "The second-quarter performance, which saw revenue from the company’s TV business rise 5.3 per cent, represents a relative bright spot for Corus, which endured a difficult 2015 that saw its stock price virtually halved and a turbulent start to 2016 as an activist shareholder, Catalyst Capital Group Inc., publicly contested its deal with Shaw. The purchase proceeded with 78.5-per-cent support from minority shareholders, and Corus is now projecting modest growth in the coming quarters as it adjusts to its new scale." "The publisher of Nova Scotia’s largest newspaper apologized on Monday after one of its stories ignited a firestorm with unverified allegations that young Syrian refugees had attacked fellow students at a Halifax elementary school. "The Halifax Chronicle Herald story, which alleged numerous acts of playground abuse at Chebucto Heights Elementary School – including an incident in which one “refugee boy” choked a girl in Grade 3 with a chain while yelling 'Muslims rule the world,' and another in which 'refugee students' threatened others on the soccer field – was published online late Friday and in the paper’s Saturday edition. It suggested school administrators had responded weakly to the alleged abuse. The story also notes that " the paper’s staff has been on strike for 12 weeks, with many inexperienced reporters taking their place." "Canadian scientists have a new outlet for their research and it’s homegrown. "On Tuesday, Canadian Science Publishing – an organization born out of the downsizing of the National Research Council – officially launches FACETS, an online multidisciplinary journal that is Canada’s most ambitious effort yet to carve a niche in the burgeoning world of open access science." The Canada Revenue Agency has formally asked the CBC to hand over offshore tax-haven data from the massive Panama Papers leak, but the news organization is refusing, the CBC web page says. The commissioner of the agency, Andrew Treusch, sent an email on Friday to the president of the CBC asking for the data, saying the agency wants to begin work immediately on reviewing the information. CBC spokesman Chuck Thompson said the corporation rebuffed a similar request from the CRA in 2013 for another massive cache of tax-haven data — and will do so again. "Almost as mind-bending as the sheer volume of data leaked in the Panama Papers, and its reach into the lives of the rich and powerful, is the fact so many journalists in so many newsrooms in so many countries were able to keep so big a project secret for so long. "It defied the natural order of things. It required journalists to go against all traditional training and view competitors as collaborators. "It demanded of a notoriously gossipy species the sort of tight-lipped discretion more typical of confessors than those in the business of spreading the news. "Yet the lid was so tight not even the New York Times, according to its deputy executive editor, knew the Panama Papers project was under way or the stories were coming. "What made it all possible, according to Rob Cribb, the Star’s lead reporter on the project, was a new attitude of collaboration born of the sheer scale of modern data-based research imperatives and the diminished resources of economically strapped news agencies. Both demand and supply suggested collaboration." "Reporter Hilde Kate Lysiak got the tip early Saturday afternoon that there was heavy police activity on Ninth Street. She hustled over with her pen and camera, as any good reporter would, and soon she posted something short online, beating her competitors. "Then Monday came and Hilde had to go back to third grade. She is 9." Rogers has announced it is parting ways with Gord Cutler, the senior vice-president of production for NHL games. In a statement, Rogers said it was eliminating Cutler’s position, moving Sportsnet’s live sports coverage and studio production “under the same umbrella” of Rob Corte, the vice president of Sportsnet and NHL production. Cutler was considered a hiring coup when Rogers won the 12-year, $5.2-billion NHL deal before last season. With no Canadian teams in the playoffs, it has been a disappointing season for Sportsnet’s NHL ratings. 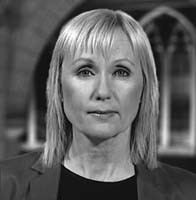 Laurie Graham, ditched by CTV as an Ottawa national reporter, has returned to her native Nova Scotia as the premier's principal secretary. She steps into the position previously held by Ryan Grant, who became deputy chief of staff. Premier Stephen McNeil says the principal secretary does outreach work with private sector and not-for-profit organizations. “She brings with her obviously the scope of not only having experience in our province, but nationally, working and dealing with what's been happening across governments,” said McNeil. Ms Graham will be paid more than the premier's chief of staff in her new role, and significantly more than the last principal secretary. Ryan Grant was making a little under $92,000 as of November. Graham will make $160,000 – $10,000 more than the premier's new chief of staff, Kristan Hines, who's paid $150,000. Grant's been bumped to $125,000 a year in his new role as the deputy chief of staff. "When Daniel Ellsberg photocopied and leaked the Pentagon Papers to the New York Times in 1971, those 7,000 pages of top secret Vietnam War documents represented what was then the biggest whistleblower leak in history—a couple dozen megabytes if it were contained in a modern text file. Almost four decades later, WikiLeaks in 2010 published Cablegate, a world-shaking, 1.73 gigabyte collection of classified State Department communications that was almost a hundred times bigger. . .
"Just five years have passed since WikiLeaks’ Cablegate coup, and now the world is grappling with a whistleblower megaleak on a scale never seen before: 2.6 terabytes, well over a thousandfold larger. "On Sunday, more than a hundred media outlets around the world, coordinated by the Washington, DC-based International Consortium of Investigative Journalists, released stories on the Panama Papers, a gargantuan collection of leaked documents exposing a widespread system of global tax evasion." When a Toronto Star journalist went to the British Virgin Islands to see whether reforms to combat tax evasion were working, he was detained at the border and put on the first plane out. The tantalizing promise of online advertising has always been to deliver the right message at the right time to the right person. But for all the big talk about “big data” and consumer targeting, finding the perfect message can still be a guessing game. Tangerine executives knew this as they tried to figure out how to promote the bank’s first ever money-back credit card, which launched this week. So rather than making one ad, they made 70. The online campaign for the new card will be testing out dozens of different messages and images to attract potential consumers to its new rewards card.